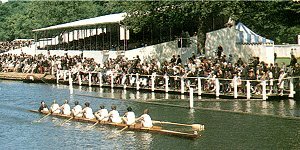 Rowing crews race on the Thames in the Henley Regatta, one of the most colourful events of the London Season. The London Season is an annual series of social events. It follows the same pattern each year, and is religiously followed by fashionable people in "Society"
Once, debutantes were formally presented to Court, but this no longer happens. However, the tradition goes on. Young girls "come out" into Society, and parents spend a small fortune to launch their daughters into the social scene, hoping to find an eligible young man for her to marry. In earlier days, each new deb was looked after by a female chaperone, an older relation of many "seasons", who steered her into the right company, and arranged suitable soiress. Today this is all much more relaxed, and the deb chooses her own friends or style of party. The months of May to August are filled with events attended by Society: the Chelsea Flower Show, held in May in the grounds of the Royal Chelsea Hospital, the lawn-tennis championships. Ascot and the Henley Regatta are two of the most colourful occasions. In July in the Royal Enclosure at Ascot you can see a great display of fashionable hats, morning suits and colourful dresses. The sport is only part of the attraction, for this is a social event. You may see and be seen by everyone else; perhaps a photographer from a fashionable magazine like Tatler may print your picture and name. 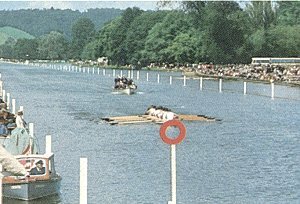 Henley Regatta, at Henler-upon-Thamea, is popular with the young crowd - the attractive setting along the riverbank, the rowing, the pubs filled to over-flowing. Henler is a less formal occasion than Ascot, as is the sailing at Cowes, on the Isle of Wight. Listening to the sailing conversations at Cowes you might imagine that everyone has a yacht and is a seasoned sailor. Many do own their own yachts, but some are just there to be part of it all. At the close of the London Season, the evacuation of the city begins. The opening of the hunting season, the glorious 12th of August, draws the game-hunters north to the Scottish estates, in pursuit of grouse. The Mediterranean draws others to villas and yachts on the French Riviera. Suddenly, the late-night revelries, the sports, the parties are over. The London Season is over for another year. The 'season' traditionally opens on May 1st and ends following the Goodwood Races in July, when Society disperses for the summer holidays and yacht racing at Cowes takes place. 1st week: Summer Art Exhibition, Royal Academy, Burlington House, Piccadilly. 3 rd week: Chelsea Flower Show, Royal Hospital, Chelsea. Last week or 1st week in June: Racing at Epsom: The Derby, followed 2 days later by The Oaks, Epsom, Surrey. 2nd week: Garter Ceremony, St George's Chapel, Windsor. Service of rededication for Knights of the full procession with Household Cavalry, etc. Windsor Castle, Windsor, Berkshire. 3rd week: Royal Ascot Races Ascot, Berkshire. Antique Dealers' Fair and Exhibition, Grosvenor House, Park Lane, W1. Trooping the Colour: Pageantry to celebrate the Queen's official birthday, Horse Guards Parade, Whitehall. Lord's Test Match, Lord's Cricket Ground, St Johns Wood Rd, NW8. Tickets: 01-289 1615. 4th week and 1st week in July: all England Lawn Tennis Championships, Wimbledon [Church Rd], SW 19 01-9469 2244. 1st week: Royal Garden Parties [by Royal Command] Buckingham Palace. Royal Tournament March Past [colourful Parade by all troops taking part in the Royal Tournament.] Horse Guards Parade, Witehall, SW1 [Sunday before Tournament, 15.00]. Mid-July: Royal Tournament [Impressive military spectacle with marching displays and massed bands.] Earls Court 01-385 1200. Royal International Horse Show [Top class Show Jumping competitions attended by royalty.] Empire Pool. Wembley, Mddx. 01-902 1234. 4th week: Goodwood Races, Cowdray Park. Promenade Concert Season opens [continuing until September] Albert Hall, Kensington, SW 701-589 9212.